Following on from my 1st Cakebox Diorama Hawkins Indiana. I starting a 2nd one Cabbage Brewery. Again using the popular culture reference of Discworld this time. I'm using alot of structure from my older Christmas layout which feature on Carl's Micro Layouts website. The main structure used are a plastercast maltings which is getting converted into the Brewery. A Dapol Inn half converstion and 2 children toy house been convert into a 2 storyshop & house plus a Copperage for the Brewery. I also raiding the spare parts bid for walls doors etc. Again I putting the thread on RMWEB. I love Discworld (and breweries, or at least their products), the illustrations on the covers of Pratchett's books have some wonderfully eccentric looking buildings in them, very tempting to model. Hugh Norwood's "Angst Lesspork" is a wonderful take of the theme in OO9. Maybe a copy of Bradshaw's handbook would be useful? It's not easy navigating RMweb (unless logged in to follow "Show New Content") though, so any chance of a link to the thread when it's up and running please Ian? Bob thats my plan, but RM Web is down at moment when normal services resumes I'll post the links. Meanwhile I've been working on the Brewery buildings, the main one is from the plastercast building, made by a local Model Shop here in Ipswich a few years ago. It getting a new loading door & platform overhead lift with covered section. 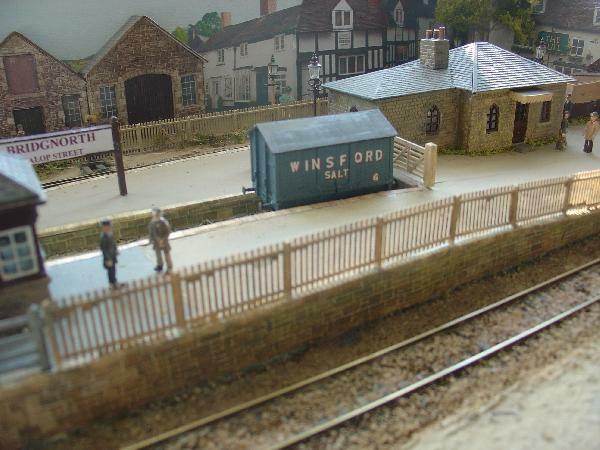 The Stables are been kitbashed out of parts from Airfix Waterloo Farmhouse out buildings, Willis walls & tile sheet. It good doing something a little outside my usual interest. Angst-Lesspork - what a wonderful take on Discworld of which I'm a fan, although I've yet to catch up with "Raising Steam". I particularly liked the Witch Take-off/Landing zone, marked W, rather than the expected H for helicopter markings. Didn't notice any trolls or Golems - train probably going too fast to see them. Here the link to my latest Cakebox micro. I have been working on Town Watch Guard Tower. Some very ingenious re-purposing of some well known, and not-so-well-known, models. One to keep an eye on. Thanks Giles more work done. street scene starting to look the part. More figures on order Peterpig 15mm English Civil War & War of Roses for Cabbage Brewery Dwarves & town watch, plus a few fantasy ones. Glad you got the half-a-Dapol-half-timber-pub in - do like that conversion. Peterpig order has arrived think the 15mm figures will make the various brewery dwarves mostly English Civil War gun crew & farmers, some holding barrels on loading dock or Copperage farmer I stables as us a pitch fork. Plus barrels for loading dock & Copperage. Town Watch have a mobile crossbow as well as War of Roses Crossbow men to along with Musketeer in the Gusrd Tower. One Fantasy figure will look great on the street very Discworld. As with drunk down alley & man in stocks by Guard Tower. I been doing some more work on Cabbage Brewery, progress is in thread. I came up with another popular cultural cross over. After paying the PeterPig stuff I got a Giant Snail with gnome rider. So I had the idea of has Slugs & snails like cabbages, what if the Town of Cabbage had problems with a band of snail raiding gnomes, and the protect the town they had a Home Watch rather than Town Watch made up from old men & young boys rather like Dad's Army. So I have made a 9 strong Home Watch with a real selection of figures armor weapons etc. Think the unit Captain Manning complete with Fez will be having standoff with the Snailrider over who has the best red hat. Also thought like any fantasy tradition way not make the Brewers Dwarfs, hence the mainly English Civil War Gun crews totaling 12 figures in all. Also have started on the 1st railway wagon a Barrel Wagon 2 plank for a large plastercast. Basically a Triang underframe made 3 axle for wieght. I having the local railway which built to a smaller loading gauge than the mainline one. This wagon been a mainline one. This is so I can use some Dundas 4mm Irish NG wagons for local line. Also I have found a paper from 1950 how to build your own Liverpool & Manchester Rocket & stock in 4mmwhich could be adapted for a open wagon. So I had the idea of has Slugs & snails like cabbages, what if the Town of Cabbage had problems with a band of snail raiding gnomes, and the protect the town they had a Home Watch rather than Town Watch made up from old men & young boys rather like Dad's Army. As a means of stopping the snail raiders they'll be needing one of these. 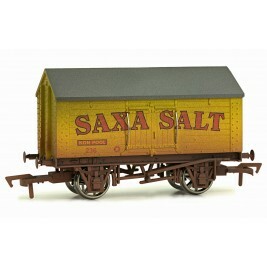 Thanks Giles & Bob never thought of a Salt Van, as this Cakebox has a short deadline, I'm only building 2 wagons the Barrel Flat plus a open bring in the Fuel for the Boiler Hose which might be something to do with Dragon waste. Will bear the Salt Van in mind if I expand Cabbage Brewery to Cabbage Station as well. Entry up on BRM website, voting on next Cakebox Challenge starts soon.